Edit your digital photos and pictures! Retouch your photos, cut photos, resize photos, optimize the colors, use effect filters, remove objects with the clone brush. You can choose between 9 different brushs like pencil, feather, air brush etc. You can open pictures in many file formats (JPG, GIF, BMP, TGA, TIF, PCX). With the scanner support you can scan your photos. This is a allround application to manipulate picture. The picture browser can shows your pictures as thumbnail preview. PhotoRetouch has been awarded a 3 star rating at A1 Yippee Shareware. PhotoRetouch got the "Softempire King" title by the SoftEmpire.com team. 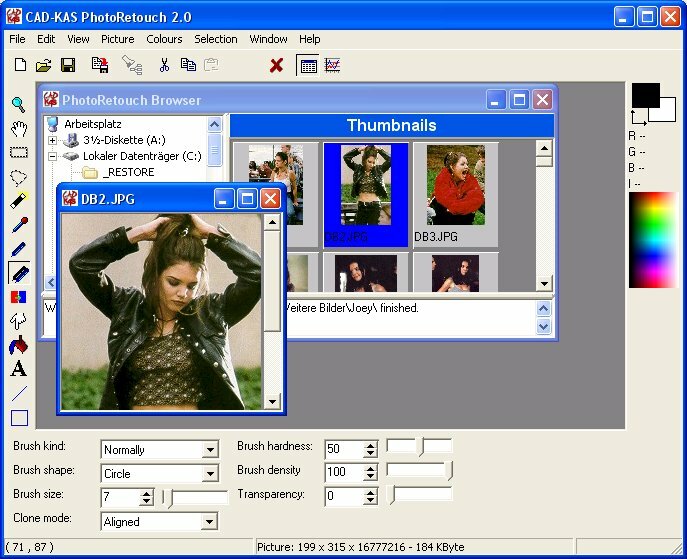 PhotoRetouch was rated with 5 stars by software directory topshareware.com.